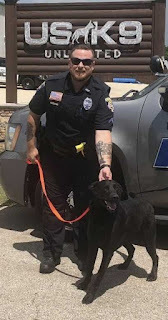 Chief Olander Smith and Franklinton Police Department welcome the newest member of their law enforcement family, K-9 Finley, a one-year old black lab. Finley is a Search and Rescue K-9 and will be used with Franklinton Police Department’s Search and Rescue/Compassion Program. She will aid her handler in searching for lost and missing individuals, and will also provide comfort while visiting local schools, hospitals, and nursing home facilities. Finley first had to pass a temperance test to confirm that she fits the profile of a comfort dog. Finley was then enrolled at the USK9 Unlimited Training Center for an 8-week training program to learn Level 2 obedience and Search and Rescue. Finley’s training is being paid in part by the Deputy Jeremy Triche Hero Foundation. Deputy Triche and his partner, Deputy Brandon Nielson, were both ambushed and killed in the line of duty while responding to a disturbance which occurred in St. John Parish in 2012. Franklinton Police Department is honored to have Finley, in memory of these officers. Patrolman First Class Anthony Cox, who is spearheading the program, has worked with K-9’s throughout his law enforcement career and will be Finley’s handler. He contacted Animal House Rescue in Hammond, who donated Finley to the Franklinton Police Department. Finley had been surrendered by her owner due to health issues and being unable to keep her. The St. John Parish Animal Control, who fostered Finley to the Animal House Rescue, is a 501 (C) (3) who rescues dogs, cats, and other neglected animals, and finds suitable homes for them. Chief Smith wishes to thank the St. John Parish Animal Control, Animal House Rescue, USK9 Unlimited Training Center and Pfc. Cox for all the work that has gone into this project.